First, despite the fact that this is primarily a blog of reviews, I am NOT going to review TItanic, the 1997 blockbuster now released in 3D. I am instead going to say that the remastered 3D version of the movie is simply spectacular, especially if seen in IMAX where the spectacular becomes exquisite. The re-release of the picture also demonstrates so very clearly why this is a motion picture that needs to be seen on a giant movie screen (hopefully, the larger the better) and not on your television, iPhone, or iPad. There it is: larger than life; underwater and above, sweeping across smokestacks, and running through boiler rooms. And the movie magic takes over once the Titanic scrapes the iceberg and the combination live-action and CGI-wizardry comes to life for the last hour of the movie. In 3D, the water simply glistens, both inside and outside. In lovingly remastered shots the focus clearly draws the eye exactly where Cameron wants it to go. Rivets pop at you; bubbles burst around you; and it all reminds you of why this movie was the Box Office and Academy Awards champ that it was. Sure, there is plenty to quibble about — there is the sappy love story (which seems less irritating now than it did 15 years ago); there is the Celine Dion song that nobody wants to hear ever again in their lives (although its orchestral variations throughout the movie serve their purpose to manipulate emotion just as they should); and there is the haunting but manipulative “nearer my God to thee” sequence while babies are put to sleep over bedtime stories and Monets and Degas float away. Yet its haunting in its beauty. If you have seen it before, by all means rest assured that it looks even better in this 3D version. If you have never seen it out of spite, this is a good time to go see it, and take a look at that technical feat that Cameron and his crew accomplished with this movie 15 years ago that seems it hasn’t aged a day. If you were too young to have seen it in movie theaters, what are you waiting for: this out-Potters and out-Games any of the current blockbusters. 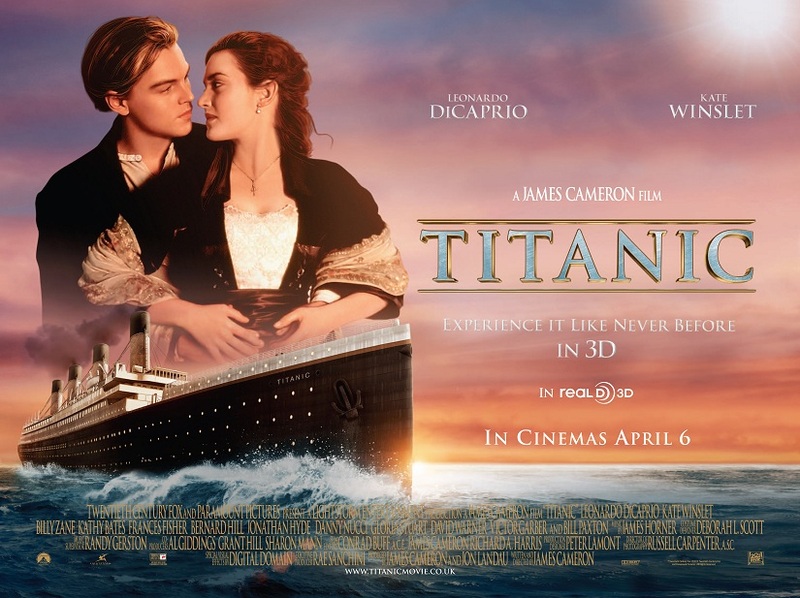 And if you have only seen it on tv, then you have not seen TITANIC. Go right now. I recall seeing this several times when it came out, one of the few movies I have ever seen in a movie theater more than once. And I feel the same way today — I have already purchased another IMAX ticket for tomorrow. Its a sweeping, dramatic, and stunning work of film that needs to be seen on that big screen, the way most of us originally saw it many years ago.